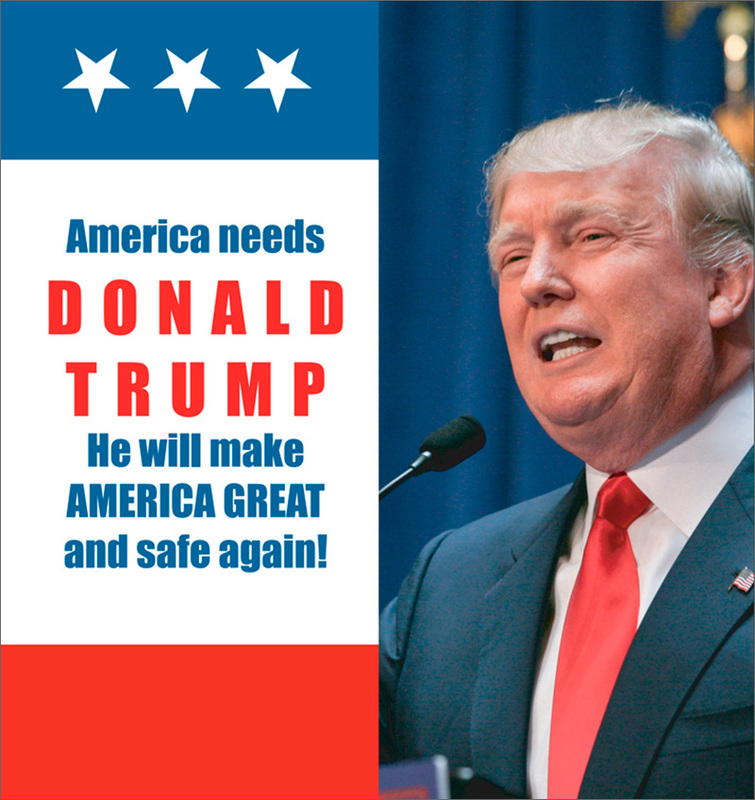 We are all aware of the forthcoming US presidential elections in November. 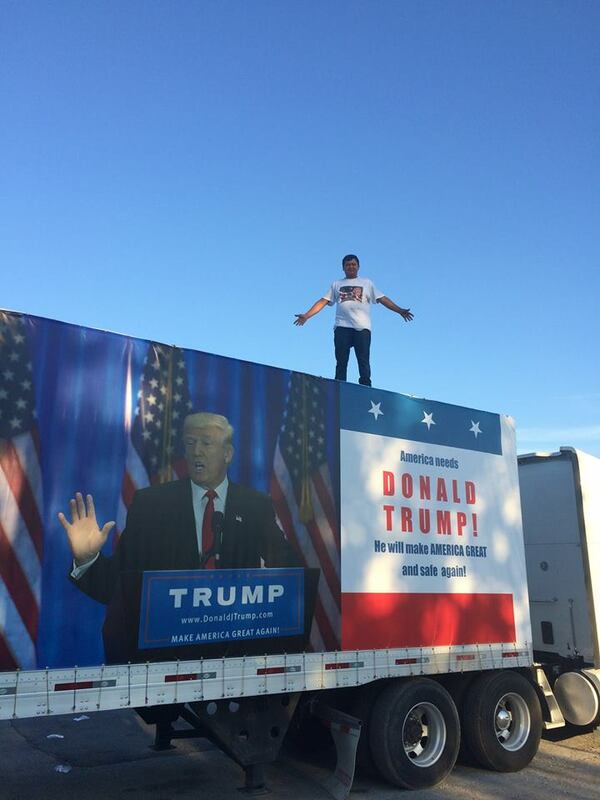 On August 4 2016, I officially announced that I support the Republican Party candidate Donald Trump. 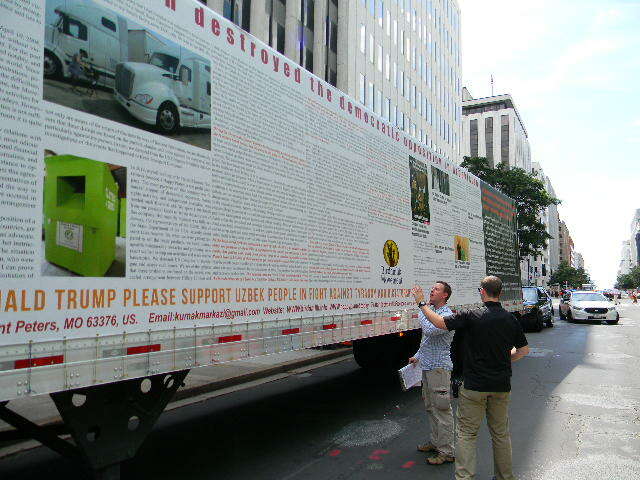 Under the flag of “Birdamlik” People’s Democratic Movement of Uzbekistan we demonstrated our announcement by installing banners on trucks that we drove from Saint Louis to Washington DC. 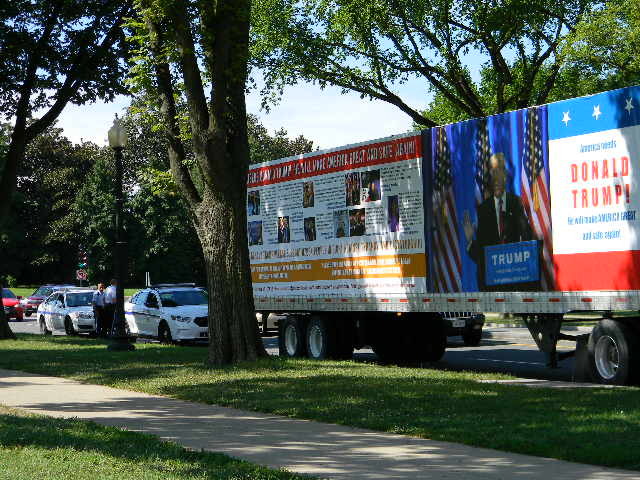 The banners on our trucks contained, alongside with the hope that future US president Donald Trump would pay attention to Uzbek opposition, notes about the corrupt relationship of former Secretary of State Hillary Clinton with communist dictator Islam Karimov, who ruled Uzbekistan for the past 27 years. On August 4, 2016, Donald Trump met with electors of Portland, Maine. At this meeting, Mr Trump called my motherland Uzbekistan “Ubek”, but was fast enough to correct his pronunciation and said “Uzbek”. This error of Donald Trump was then used by his rivals as some information attack against him. This information attack was widely arranged in mass media of Karimov’s regime. In his speech to the electors, Donald Trump tried to specifically stress the issue of terrorist Fazliddin Qurbonov, who is a former Uzbekistan citizen. By fully supporting Mr Trump’s words, I would like to try to analyze present day social and political views of Islamic world in the example of Uzbekistan. I would like to stress that these views are solely mine and I do not have a slight intention of throwing a stone at Islamic world. Having said that, I would like to note that it’s an honor for me to be a supporter of secularism and democracy. I am an ordinary Muslim with Uzbekistani origin. My adolescence was spent in the atheistic country under Soviet management. I came to know a little about Islam during my University years and later when I was running my own business enterprises. I always tried to adhere to Islam religion within my capabilities in obedience to Allah and to be God-conscious and in creed. In 2001, my activities were jeopardized and I had to face accusations. As a result, I had to spend over 6 months in jail in one of the prisons of Uzbekistan. I managed to get acquainted with many politically religious people while sharing a 10 person prison compartment with up to 56 people in totally anti-sanitary and hygiene conditions. Although I did not support their religious-political views, in the prison I witnessed the oppression and torture that used to be organized against religious prisoners. This caused a feeling of sorrow in my heart. After my release in 2003, I joined several Human Rights organisations. In 2004, I founded the “Birdamlik” People’s Democratic Movement, which is focused on the nonviolent fight against Islam Karimov’s regime. Being aware of the oppression and torture against religious people, I supported the activities of some human rights organizations for several years. Though I fully understood that the autocracy headed by Dictator Islam Karimov is one of the main problems in Uzbekistan, I sometimes tried to carry out political activities with religious political people for I did not quite realize their clear purposes and intentions. I respected the decision of democratic countries to grant political asylum and I always tried to find the ways of contact with Islam world. My personal acquaintance with many religious people enabled me to expand my understanding of political Islam. During my 12 years of life in migration, I managed to sufficiently realize the extent of Islamic terrorism in the world. In its sense, Islam is a religion of goodness. It is based on Hidayat – the right path. As it happened with Christianity in the past, today this religion is becoming a religion of violence. A few centuries ago, Christianity was reformed and political Christianity was almost put to an end. Nowadays, Christian religion followers live in developed democratic countries, where religion is practically separated from politics and in its turn, Christianity has become a promoter of peace by refusing to carry politics and not influencing it. Unfortunately, we cannot apply this to today’s Islam religion and world. Though Islam is a stable religion and has not changed, different views and different schools have appeared. Some rulers used Islam to cover their actions in a wish to conquer countries. As a result, they inevitably separated Muslims into different groups. This factor has widely spread everywhere in Islamic world. In this way, Islam has not managed to drive away from politics and has intergrown with geopolitics. Now the Islamic word incorporates hundreds of contradicting, rival groups, orientations and schools. According to Umar, one of the followers of our Prophet Mohamed: “The one thing that destroys Islam sense is erroneous sayings of people, in trying to prove their violent views by Quran ayats and Hadiths, hypocrites tell lies to Muslims and become some of those, who make violent decisions”. I believe that Islam has many years to come and enormous efforts to be made before it becomes a religion of peace – only by detaching itself from politics, recognizing secularism, approaching other religions and sects with respect and tolerance. But I must tell one real truth: political Islam has been put into crisis because of a wrong interpretation of the sacred book of Islam – Quran by Ummat of Islam. It has become an enemy to secularism and democracy. It would be closer to the truth to associate the crisis of Islam world with erroneous interpretation of Quran instead of finding faults with the USA, Western World or Israel. Today, 5 of 15 republics of former Soviet Empire, which collapsed in 1991, are included in Central Asian countries. After gaining independence, these countries gave Islam religion wide opportunities. These countries saw rise of old conservative Islam. However, together with conservative Islam, various sects and groups (i.e., political Islam) also penetrated the country, which was totally strange to Uzbek people. Terror and violence grew wide by supporters of political Islam in the country and the situation got worse and worse by the day. Due to mercilessness and cruelty of the head of state Islam Karimov, political Islam was put to an end. Unfortunately, due to the liberal values and democratic opportunities of the Western world, some members of this political Islam impudently use the opportunities, which these countries give them and abuse the democratic values. They still continue their violence in these countries without any difficulty or obstacles. The supporters of this political Islam are rising absolutely against Western civilization, secularism and democratic values. In its sense, it is a crime from their side to be intolerant to Christians, who live in the countries, which have given them shelter. In reality, the declaration of human rights activists, their declarations that Central Asian countries are not letting people have religious freedom are incorrect. For over a thousand years now, conservative Islam has had real freedom in these countries, but political Islam that has been imported has no freedom to exist. Political Islam ruins secularism and abolishes democratic values. It is not without reason that majority of political Islam supporters, even in America, wish to create a Shariah state. We mentioned earlier that the roots of political Islam go to Western countries, particularly the USA. I want to say a few words about the supporters of political Islam, who came from Uzbekistan. All freedoms and democracy in the US have opened opportunities for systematic activities of political Islam supporters. They have expanded and are expanding their ideas and number of their members by sufficient use of social, political and economic support of the USA. In one of my speeches about the issue, I called one of such persons Mirahmat Muminov an “ideological terrorist”. The purpose of these people is establishing an Islamic state – a caliphate in Uzbekistan based on Shariah and later extending this caliphate to other countries by force. I know a man named Muzaffar, who lives in Saint Louis, Missouri is a votary activist of political Islam. 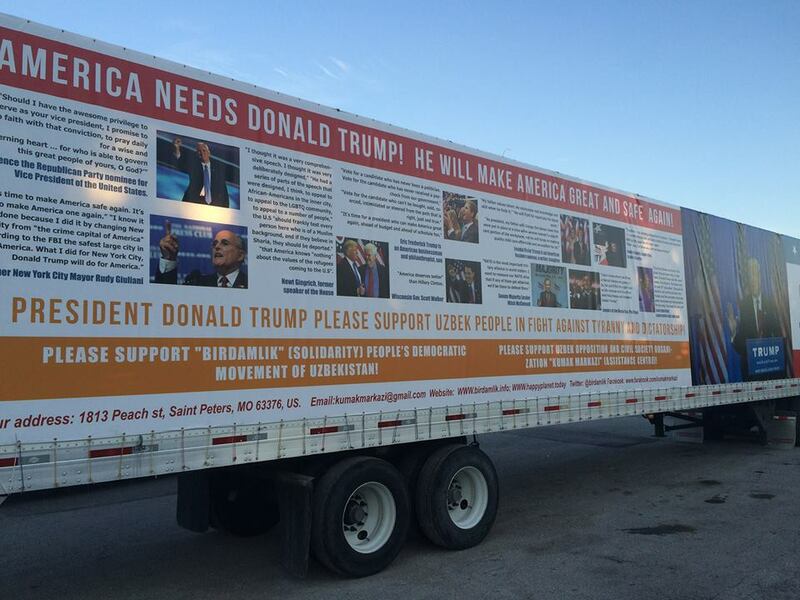 This man has not worked a single day in the USA. By fully using all the opportunities in the USA, he obtained US citizenship. Yet this person is totally against democracy. Although for some reason he has had material opportunities of democracy, he is performing actions to ruin US legislation from inside by acting in breach of US legislation. This person has always been carrying out wide propaganda for political Islam. In reality, we should realize that Donald Trump talked about such people. While obtaining US citizenship, any person must have a command of English and take an oath to be loyal to the state of the USA! No candidate other than Donald Trump is paying attention to those who are obtaining US citizenship, do not speak English while they know Arabic, and stand against secularism and democracy. In reality, those who are shouting about humiliation of Islamic values have nothing to do with the supporters of conservative Islam and such people make the majority Islam Umma. The supporters of conservative Islam – in other words, those who care about earning their bread, work and education – are ordinary people with no interest in politics, economy, dictatorship or democracy. Today, we can directly call those who are drugging the name of Muslims through the mud real Islamic terrorists and those who are slandering secularism and democracy real supporters of political Islam. It is a real truth that after failure to implement their propaganda, political Islam supporters turned to violence and terrorist acts. If any countries who cannot keep the religious commitment at low levels by active propaganda, the supporters of political Islam can turn any conservative Muslims into political Islam supporters within a year or less. Thereafter, within 1-2 years of training and propaganda, any political Islam supporter can be turned into a potential terrorist. If we take into account the fact that thousands of political Islam supporters found asylum in the USA, we can then realize what kind of danger American government is facing. The capture and imprisonment of several Uzbekistani terrorists can be brought as a vivid example to this. We should always bear in mind that no supporter of political Islam would ever accept democratic values. They treat the interest rates, which are the basics of modern banking system as Haram and feneration – and they always question the matter of secularism. We can find thousands of those Uzbekistani political Islam supporters in the USA. Using religious pressure, most of these are making their compatriots, who came from Uzbekistan, work for their purposes. Until now, none of such has ever fought for democratic changes in Uzbekistan. From what I have learned from life observations, supporters of political Islam will never become supporters of secularism and democracy. They cannot accept democracy. According to the understanding of these people, the United States of America is on the wrong path. They want the USA become an Islamic state. Therefore, according to their interpretation, even, the USA must in future become an Islamic state. They cannot accept any other condition. The purpose of obtaining an asylum and the right to live in the USA is setting up and carrying out their propaganda without any problems. Their primary purpose is keeping the religiousness level of the Muslims in the USA at a high level, preventing Muslims from assimilation with the Western world. This multiples the Muslim people and the intensive propaganda of Islam within the USA, eventually turning Europe and the USA into Islamic states. At the current moment, democracy and Islamic world cannot exist together. Because of the influence of political Islam activists, even 75% of Muslim people, who are living in democratic countries after they were given asylum, are against democratic values. In Islamic states this figure is as high as 95%. I think, that approximately 15% of population in the countries – which were segregated from former Soviet Union like Uzbekistan, Kazakhstan, Azerbaijan, Kyrgyzstan and Tajikistan – are against democratic values. It is important for the US government to adjust their political steps with Muslim countries on the basis of these figures. Consequently, by taking into account the attitude to secularism and democracy of Muslim countries, whose populations are against democracy and secularism, the USA and other countries should assist in coming to power of the countries of those sects, orientations or groups that are close to moderate political Islam and conservative Islam. Such state management should be close to the model of Hosni Mubarak in Egypt and they should be a state ruling close to monarchy that is able to establish equal and diplomatic relationships with the USA and European countries, including Israel. If this route is chosen, the bloodshed of political Islam in trying to create a Shariah state through ignorance and violence would be stopped. The world vision, mentality and attitude to religion in Central Asia, particularly in the 5 countries of Turkestan, are totally different from those in Middle East countries. Therefore, conservative Islam should be allowed while political Islam has to be stopped; and any political Islam refugees should not be given any refugee status anywhere. While accepting the closeness of the population of these countries to secularism and democracy, democratic reforms can easily be undertaken. These countries should be included in the list of countries that can establish democratic and secular systems and create free market economy. The US government should run their own respective policy in relation to these countries. Only 5-6% of Muslims within political Islam can put democracy and Islam together, while the rest, though unable to openly refuse democratic requirements, internally negate it. If such type people are not allowed entrance into the USA and refused asylum, what can they do? They have a few options. а) They distance from the purpose of political Islam and building a Shariah state. b) They can adhere to conservative Islam that is allowed in their own countries and live peaceful lives. c) It is not out of probability that they may die or get imprisoned in fighting against the regimes in their countries. d) They may join groups, active in other countries and die there. Only in this case, political Islam can be abolished and Muslim countries may establish peace. In any cases, their threat to Western world would ease. Political Islam activist should be allowed entrance to the USA as guests, tourists or on business. But granting them asylum for their political or religious beliefs is a mistake. The reason to this is that they value Shariah more than democratic values. In such cases, they will always be after not for democratic values, bur on the contrary, for abolishing of democracy on the way to Shariah. While humans need water and food to live together with adhering to religion, today’s Islam population need to respect democratic values. Only the American nation can make a decision on how correct it is to give asylum to those Muslims who cannot value democracy. Terrorists cause danger to Western civilisation and democracy, but political Islam is much more dangerous than terrorists, because they are hypocrites and liars. They may declare and show themselves as democrats, but their internal world is totally different – in other words, they are against Western civilisation and democracy. They are adding more to the members of political Islam from amongst conservative Muslims. There is intensive pressure and pursuit from political Islam to those conservative Muslims, who obtained asylum in the West, particularly in the USA. As a result, ordinary Muslims are joining political Islam due to persuasive influence. They are thus unable to assimilate with Western culture and countries. In my opinion, the USA and European countries should accept those Muslims, who accepted the culture and values, established on the basis of democratic values. All religious institutions, including mosques, should carry out their activities against the requirement of accepting secularism. Otherwise, their activity should not be allowed. Because whether the Western world likes it or not, such institutions will remain in political Islam’s hands as centres of propaganda against the Western world. Those Muslims who obtain asylum or otherwise obtain the right of residence in the USA should respect the American constitution and treat this sacred document no less than they respect the Quran! Otherwise, they should not be allowed to stay in the USA! I think in the future that the team headed by new president Donald Trump should readdress the files of Uzbekistani people, who came to the country from Uzbekistan for political and religious reasons, and give a legal assessment to such. Should this happen, I am sure that 90% of those who were given political asylum will be found to have obtained such asylum falsely – and about 100% of those who obtained religious asylum will be found to be against the US state system and democratic values. The Muslim people should accept secularism and democracy. Without this, it will not be possible to achieve peace in Muslim countries. But we would be mistaken to think that in our future, Muslims will automatically accept secularism and democracy. Acceptance of secularism will enable our society to stop violence and wars in Muslim countries. I really believe that Muslim people will turn to education and progress – and Islam, along with other religions, will become a religion of goodness and peace. Leader of “Birdamlik” (Solidarity) People’s Democratic Movement of Uzbekistan.